Clinically shown to support a healthy mood! ProEPA™ is an omega-rich formula derived from the component of fish oil that helps lower cardiovascular risk factors and maintain a general sense of calm. 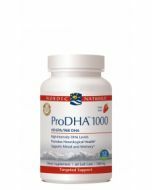 Original research on ProEPA has also shown proven benefits for fat metabolism and healthy blood sugar levels. 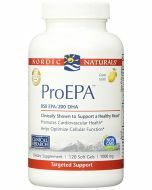 Nordic Naturals ProEPA, one of the industry's highest concentrations of EPA from fish, is enhanced with natural lemon oil in both the soft gel capsule and oil for great lemon taste. ProEPA is molecularly distilled for purity and concentration, and has added rosemary extract for superior freshness. This high concentrate formula provides excellent nutritional support for the body to manufacture vital series 3 prostaglandins, and is repeat and odor free. (Less than 5mg of Cholesterol per serving). 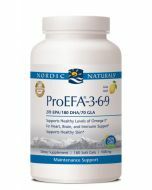 Ingredients: Purified deep sea fish oil (from anchovies and sardines)‚ soft gel capsule (gelatin‚ water‚ glycerin‚ natural lemon flavor)‚ borage oil (borago officinalis)‚ d-alpha tocopherol‚ natural lemon flavor‚ rosemary extract (a natural preservative).